The latest launch of new Housing Board flats includes two projects in the mature estate of Tampines, which experts expect to be popular. Yet, the hottest project as of 5pm yesterday was Buangkok Woods in Hougang instead. The lower prices in Hougang might be a factor, said experts, with National Development Minister Lawrence Wong also highlighting their affordability yesterday. There are 4,841 flats up for sale in the August Build-to-Order (BTO) exercise which began yesterday, across five projects: Three in the non-mature towns of Hougang, Sembawang and Yishun, and two in Tampines. 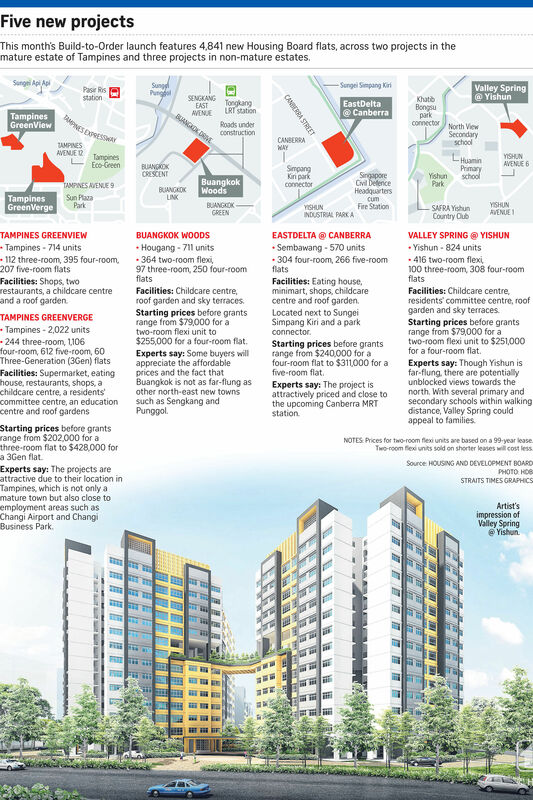 Property experts expect the two Tampines projects to be the most popular due to their location. But ERA Realty key executive officer Eugene Lim added: "The other projects should also see healthy demand by applicants as they are very attractively priced." Before grants, the starting price for a three-roomer is $202,000 in Tampines, but just $156,000 in Yishun and $165,000 in Hougang. Similarly, the five-roomer starting price is $398,000 in Tampines and $311,000 in Sembawang. Affordability is one reason Madam Safiah Mohamed, 50, is applying for a two-room flexi flat in Yishun. "It is also near my relatives' place and where my son is studying in ITE College Central," said the kitchen crew member who lives in a rental flat with her two children. In a Facebook post yesterday, Mr Wong noted that a typical three- room flat in a non-mature estate like Hougang costs about $185,000. "Eligible first-timer couples can also benefit from housing grants of up to $80,000," he added. "At these prices, first-time home buyers should be able to finance most or even all of the monthly loan instalment using CPF (Central Provident Fund) alone." At 5pm yesterday, there were six applicants for every 10 available units in Hougang's Buangkok Woods. In contrast, there were just two applicants for every 10 three- room flats in Tampines and three for every 10 of its larger flats. The units on offer include 780 two-room flexi flats in Hougang and Yishun. Such flats are often popular as they are the only available flat type for single buyers. They are sold either on 99-year leases or shorter ones for elderly buyers. With prices starting at $79,000 for a unit on a 99-year lease, buyers eligible for the maximum housing grants will have to pay only $4,000. Short-lease units cost less. At 5pm yesterday, there were already 362 applicants for the 364 two-room flexi units in Hougang. One of them was cleaner Wendy Teo, 65, who wants to sell her four-roomer in Choa Chu Kang, and finds the short lease attractive. "I don't need such a big space," said Madam Teo, who lives alone. Applications for this exercise close on Tuesday next week. Buyers interested in mature estates might wait until November instead, said experts. There will be 5,090 BTO flats launched then: About 2,180 in Punggol and the rest in the popular estates of Bedok, Bidadari and Kallang/Whampoa. "Many BTO flat applicants are excited about Bidadari, an upcoming and convenient new estate," said R'ST Research director Ong Kah Seng. Engineer Kee Soon Kiat, 31, and his wife are mulling over whether to apply for a Tampines flat now, or one in Bidadari in November. The couple are considering a four- or five-room flat, and prefer the convenient locations of those estates. There will also be a Sale of Balance Flats exercise in November, with about 5,000 units, including those in mature estates. Cleaner Phua Sia Kim, 44, is waiting for that. " I prefer a flat in a central area such as Tiong Bahru," she said in Mandarin. Got a burning question about housing? Housing reporter Janice Heng can answer your questions.